In our time the anthropoligists and philosophers have tried to find the boundary line between wild and tame, nature and culture, the uncivilized and the civilized. The line is easily found for other species. But we will have tamed ourselves, and how?Halloween has become more important since we bought this house. It is the only day of the year when I talk at length to our neighbors. Sure, the guy next door will ask me about the Heidegger I'm befuddled with as I struggle to tend to my grilling during summer's dog days, but it is only on that spooky night do we as a loose gathering of people who habitate in such proximity actually listen and espouse. This season I had devoted more time than any of recent memory to reading about the supernatural, the chilling and those unnamed bumps in the blackness of our primitive souls. When the actual holiday arrived I had stumbled across that morning a couple of volumes of Davenport and subsequently discovered myself rathered adhered. Davenport is like a neighbor who when asked attempts to inform and entertain. I loved the pieces on Joyce, Whitman and Thomas Merton. The latter has been a source of serial concidences as of late. 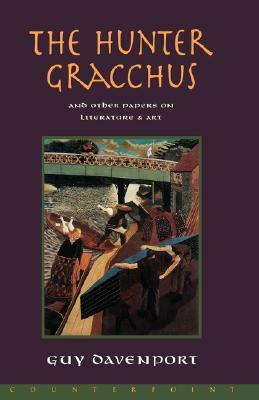 The Hunter Gracchus collects pieces of Davenport's non-fiction not otherwise found in The Geography of the Imagination, which is, honestly, the superior anthology. But there’s plenty of good stuff here too.